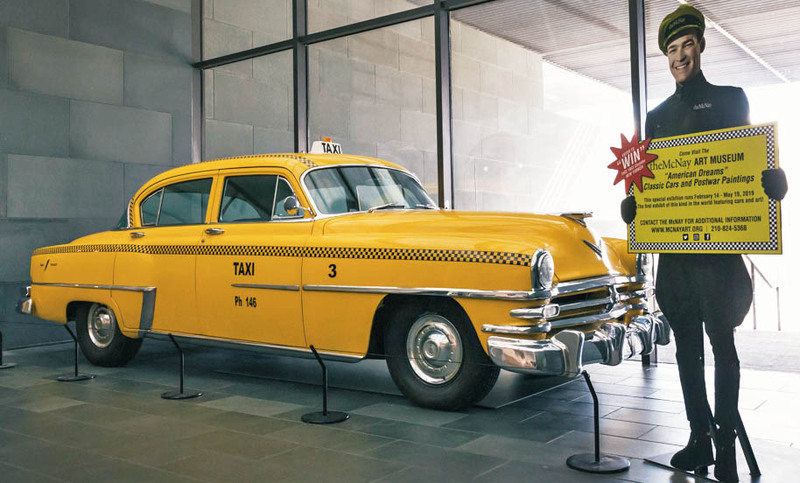 The taxi will be on view in conjunction with the exhibition American Dreams: Classic Cars and Postwar Paintings at the McNay Art Museum from February 14 - May 19, 2019. For the first time in museum history, the McNay presents an exhibition combining paintings and cars. American Dreams: Classic Cars and Postwar Paintings explores the ingenuity and innovation of postwar America presenting 10 classic cars, including a 1948 Tucker Torpedo, 1958 Corvette, and 1969 Chevrolet Camaro (custom Spurs car), as sculpture alongside paintings by Robert Indiana, Grace Hartigan, Roy Lichtenstein, Joan Mitchell, and Ed Ruscha. In the early 1950’s, cities were beginning to allow smaller wheelbase cars to be used in taxi fleets, which up until then had to be on a long wheel base. These new regulations allowed Chrysler to compete with Checker as the two major taxi producers. In 1952, the company restyled the New Yorker design with new sheet-metal and updated many of the mechanical features, with over fifty new improvements, including upgrades to the wipers, heaters, frames, carburetors, suspension, and drive train. The large backseats gave the Chrysler New Yorker a definite advantage as a taxi. The drawing will be held on Sunday, May 19, 2019. Winner does not need to be present to win. The winner will have 30 days from the date of the drawing to take possession of the vehicle. The ticket price is not tax deductible. Prize is subject to federal income tax. Winner is responsible for all applicable state and federal taxes. Taxes must be paid to the McNay Art Museum prior to taking possession of the vehicle. No cash-out option. Winner of the vehicle will be responsible for all applicable taxes, titling, and licensing upon from the Museum. Current odometer reading is about 43,000 miles. View the full list of raffle rules here.